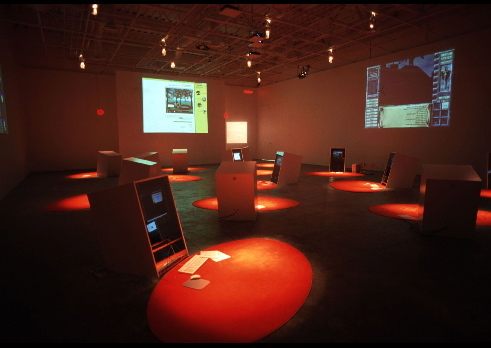 In 2000, I co-curated (with Robert Nideffer) the exhibition "SHIFT-CTRL: Computers, Games & Art," which took place at The Beall Center for Art and Technology, in UC Irvine's University Gallery, and on the Internet. 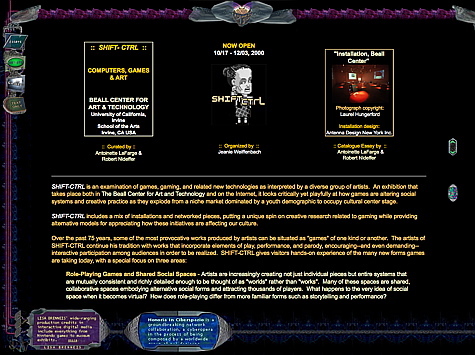 "SHIFT-CTRL" was one of the earliest large-scale exhibitions about computer games, and one of the first to seriously examine the relationship between computer games and art. "SHIFT-CTRL" focused on three areas of contemporary practice: role-playing games and social networking environments; evolvable and emergent systems; and 'world hacks' and similar projects that recode existing software. The exhibition design, by Antenna Design, broke the space into two distinct areas. 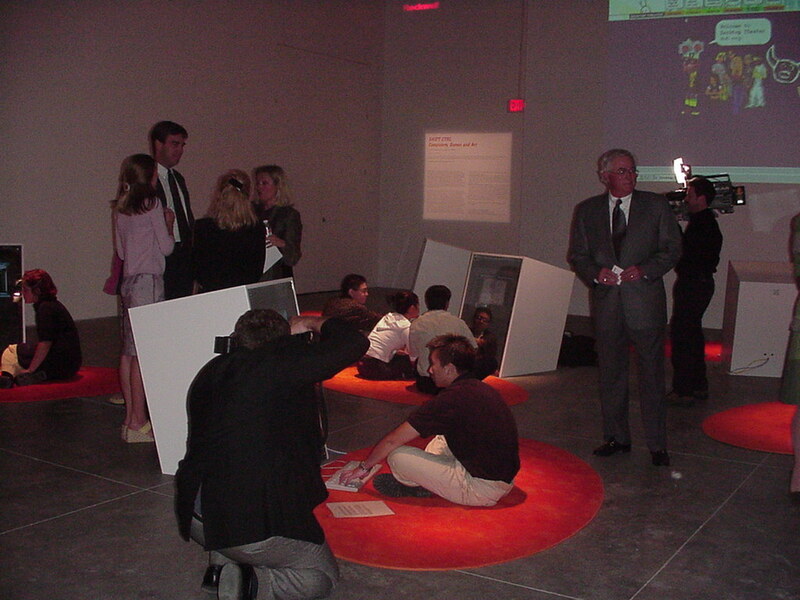 One—an open area with computer stations scattered on the floor by orange rugs for users—was an extension of the informal settings in which most users encounter computer games. The other—six self-contained alcoves fronting onto two sides of a long hallway—housed more complex and sound-sensitive installations, creating areas of semi-private use as well as a public space of shared viewing. "SHIFT-CTRL" included both established and emerging artists, including Rebecca Allen; Perry Hoberman; RTMark; Mongrel; Eddo Stern; Natalie Bookchin; Negativland; Jodi.org; Ken Feingold; Christa Sommerer and Laurent Mignonneau; Grahame Weinbren; Lisa Brenneis and Adriene Jenik; Janine Cirincione and Michael Ferraro; Jane Prophet, Gordon Selley, and Mark Hurry; Lev Manovich and Norman Klein; and Eric Zimmerman. A website was created for the exhibition to serve both as a web catalog and a site of information and resources relating to the Internet-based works included in the show. My show essay is archived on that site and also available from this page's sidebar.